Bus users across Metro Vancouver will benefit from a temporary drop in fare prices as TransLink grapples with how to make the Compass Card effective across the system. Beginning Oct. 5, bus users will be able to travel across all zones on a one-zone fare ticket all day every day. "Over the next few weeks you will notice our compass vending machines are going to be turned on at the Skytrain stations and at Seabus terminals and customers will be able to purchase tickets," said Cathy McLay, CFO of TransLink. 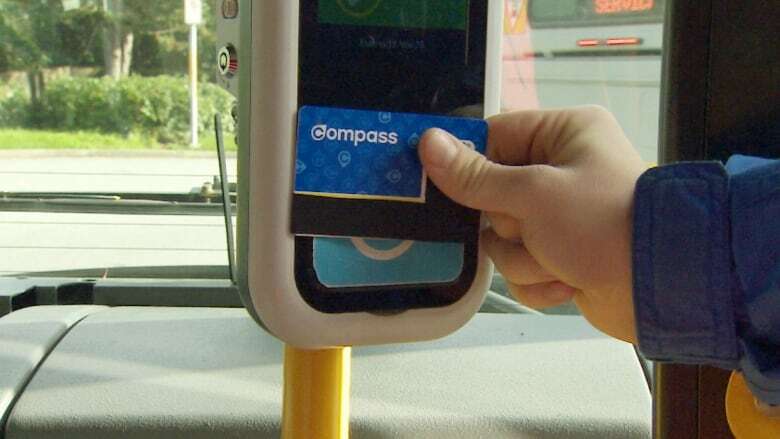 The Compass electronic fare system for Metro Vancouver has been in the works for six years, but it's been a bumpy ride and more than two years after the original deadline. McLay, who will also become TransLink's acting CEO Aug.11, said Thursday that any shortfall in revenue from the one-zone bus fare was expected to be covered by an associated increase in bus ridership. Asked if more buses would be scheduled as a result, McLay said that the No vote in the transit plebiscite meant there would be no extra capacity. She said that once the Compass Card system was fully up and running in November, TransLink would begin gathering data for a future fare policy review, but insisted there is no plan currently in place to raise fares. TransLink suggested the fare drop in May, as a way to deal with problems they faced with the cards on buses after testing showed the card readers are inaccurate and too slow. Instead of properly reading the card, the card validators take too long to tap out — potentially creating lineups as riders leave buses — and riders who forget to tap out could be charged for three zones. The fare — described as "temporary" by TransLink — will be in effect until further notice and applies to all bus-only travellers as well as users of the HandyDART system. "What that means is that any route that crosses a boundary will be cheaper to take by bus than by Skytrain," said Jordan Bateman, the B.C. director for the Canadian Taxpayers Federation. "So for example you can take a bus from Langley to Lougheed Skytrain Station ... that will be cheaper now than taking Skytrain from Surrey Central to Lougheed Station which could mean you could see more people on buses rather than Skytrain and that flies in the face of years of what Translink has been trying to do." Bus operators, such as Nathan Woods, like the changes. "There is the possibility down the road that we could end up doing all door boarding which would eliminate virtually all conflicts that we have with our passengers over the fare." Over the next several weeks Compass vending machines at SkyTrain and SeaBus stations will be activated, and cards will be available for purchase at retail outlets by November, TransLink said Thursday.